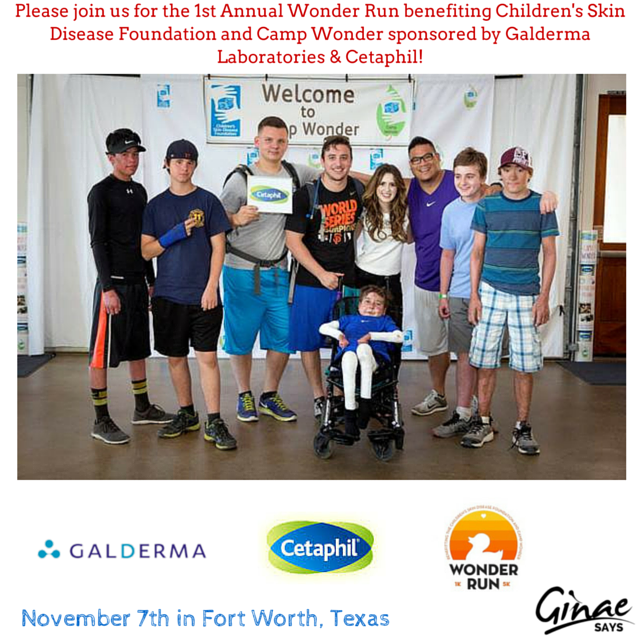 On behalf of the Children’s Skin Disease Foundation (CSDF) and Camp Wonder, This 1st Annual Wonder Run 5K will take place on the seventh of next month (November), in your gentle writer's hometown, Fort Worth, Texas. 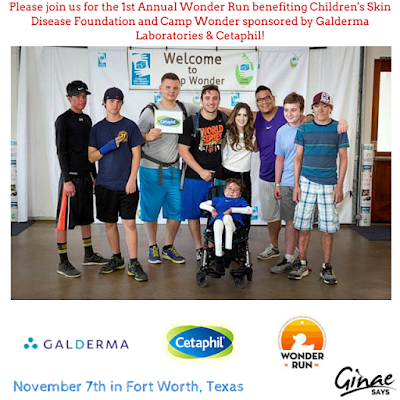 Galderma U.S. and its Cetaphil brand are dedicated to educating others about the CSDF and Camp Wonder. The run will also bring the community together, so that these remarkable children can become part of a caring social network. The run will take place downtown on the Trinity Trails and Trinity River at the Martin House Brewing Company, which is located @ 220 S. Sylvania Avenue. Strollers and dogs are welcome. Parking is available. The 1K Fun Run is for children 12 and under who wish to participate. It begins at 8:30 a.m. The 5K Run/Walk begins at 8:45. Special guests will be available for on-site interviews. To RSVP and to arrange such an interview, please contact Alli Good (agood@lippetaylor.com) or Phoebe Malles (pmalles@lippetaylor.com). For more information about the Wonder Run, please point your browser here. Headquartered in North Fort Worth, TX, Galderma U.S. is the number One affiliate of Galderma, a global leader in skin health. Galderma’s mission is to partner with health care professionals around the world to meet the skin health needs of people throughout their lifetime. Galderma is also a leader in research and development of scientifically-defined and medically-proven solutions for the skin, hair and nails. Over 65 years ago, a leading pharmacist created the first Cetaphil product – a gentle, yet powerful formula that would clean without stripping and moisturize without clogging. Today, Cetaphil is the #1 dermatologist-recommended brand of cleansers and moisturizers and is recognized around the world. With leading global skincare experts, we continue to develop innovative skincare technologies for products with Gentle Power that help restore, protect and maintain your skin’s health every day.